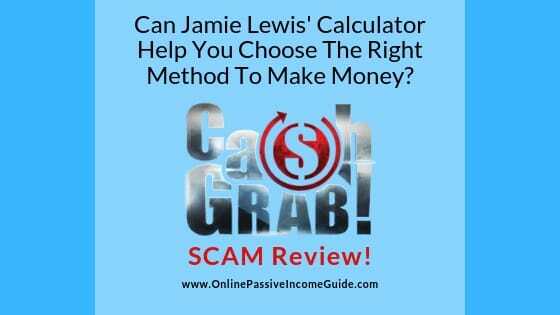 Cash Grab Review - A Scam Or Is Jamie's Calculator Useful?! Cash Grab Review – A Scam Or Can Jamie Lewis’ Calculator Help You! Welcome my friend to this Jamie Lewis’ Cash Grab Review! Jamie has come with a new program that is supposed to help you choose between the many different methods of making money online such as freelancing and affiliate marketing based on your experience, the income you would like to generate and the time available for you. And he claims that it is impossible to fail with this new program. How realistic are these claims and how accurate Jamie Lewis’ calculator is? This is what I will be answering you in this Cashgrab Review. 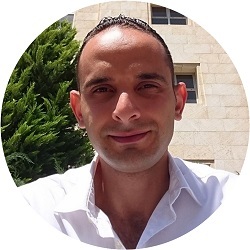 And if this is not something that can really help you, then I will help you know the best method of making money online which requires the lowest possible investment, the one that is associated with the lowest risk level, and the one the is the least stressful. Price: $37 For The Front End. Optional Upsells for $496. You might also need to pay for tools and ads. Cash Grab is a program by Jamie Lewis that is supposed to help you choose the method that suits your level of experience, the income you want to generate and the time you can allocate to applying the “system”. The system is supposed to tell you how much time you need to put as a “Preparation Time” in advance in order to make the monthly income you desire. And based on that and on some other factors like your experience level and the money investment you can put in advance, you choose one of the 50 methods that Jamie Lewis shares with you in this program. I don’t believe that you can rely on a calculator to tell you what method if best for you, as the same method can generate you thousands per month, and can generate others nothing, depending on your continuous effort and decisions, and depending on where you learn that method. And anyway, I don’t know what you are going to do after you choose the method that suits you, is Jamie going to teach you that method? I don’t think that he offered a training material for 50 methods inside the CashGrab program. Even if he did, then like the Income Elite Team and the Income Blueprint, I don’t think that the material will be detailed enough to learn any of the methods well to the extent of making money with it. And each one of them is supposed to teach you how to make money with only ONE method, and non of them has provided enough training to help you really make the income claims they made. So, I don’t expect the Cash Grab program to provide you with a proper training on one of the 50 methods of making money online. How Does Cash Grab Work? Cash Grab works by letting you in for the $37 of the front end product that will allow you use the useless calculator that will let you know how much time & money you need to invest in the method that you should follow in order to make money online, and then, they will blast you with upsells for around $494! The above screenshot is for the calculator that Jamie Lewis will provide you with inside the members’ area of the Cash Grab program, which is supposed to help you calculate the time you need to put in advance in order to generate the monthly income you desire to have. And the following screenshot is for the results that show you the estimated time you need to put so that you make the desired income. As you see, in order to make $2,000 per month for example, you need only 4 hours of work in advance! You can’t make $2,000 per month working only 4 hours for one time with any method, whether online or offline. Every method has its own learning curve that you need to follow before you make any money, and you need to put the time and effort consistently before you make this level of income. Inside the members’ area of the Cash Grab program, you will get the calculator mentioned in the previous section, which is supposed to help you know how much time you need to put in advance in order to generate the income level you are seeking. Also, there’s a guide about the estimated cost and level of experience you need for each method you will follow in order to generate income online. Each one of these methods needs a detailed training in order to generate a sustainable income with it, and one program with training tutorials on all of these methods won’t be enough to learn any of them in my opinion, like it is with the other programs by Jamie Lewis that I reviewed earlier. The cost of the front end of the Cash Grab system by Jamie Lewis is $37 one-time fee. Upsell #1: $297 for VIP resource mine. Upsell #2: $197 for live coaching. And depending on the method you choose to make money with, assuming that you didn’t need to purchase another training for that method, you will probably need to pay for tools, web hosting, ads, …etc. The good thing is that there is a 60-days money back guarantee if you purchase the Cash Grab through this link. But I don’t recommend that you waste your time in the first place as the program will probably leave you nowhere when it comes to taking action and building a real online income. There’s a 60-Days Money Back Guarantee. You will need it when you realize how useless it is. As I explained earlier, the “Prep. Time” that is estimated by the calculator in the Cash Grab program are unrealistic. You can’t work four hours for one time and make $2,000 per month, lol. 2 – The Success Guarantee! The sales page on the cashgrab.org website tells you that it is impossible to fail! This looks like an income guarantee, which is illegal to give as I know! There’s no method that is completely guaranteed, but there are methods that are less risky than others. And if you want to learn the most newbie-friendly method that requires the lowest investment and comes with the lowest level of risk, then..
==> Check My FREE Make Money Online Guide Here (Training & Tools Included)! I have nothing against Jamie Lewis on the personal level. But when it comes to training programs on making money online, none of his programs that I reviewed was worth the money or time in my opinion. His programs provide very generic information that you can easily find better for free anywhere. The “value” you get in his programs leave you nowhere when it comes to applying and really making money online. That’s why I can’t recommend this program. I though that Jamie said that the only cost of CashGrab is the $37 you pay to get in. But the truth is that there are two upsells for the total cost of $494 (around 13 times the front end cost), makes me wonder if this is a useful program, or is this just another program that is designed in order to make money FROM YOU. 5 – Pay For What Exactly?! For the calculator that doesn’t help you do anything, or for the “video tutorials” that will leave you nowhere when it comes to the practical side? Who Is Cash Grab For? For Jamie Lewis to make money from you, as usual with his other programs. The support for Cash Grab program by Jamie is available through their website, but there’s not enough feedback about it since it is still new. Conclusion – Is Cash Grab A Scam Or Legit? Jamie Lewis’ Cash Grab is not a scam since you actually get something in exchange for the money, and there’s a money back guarantee. But I consider it useless and a waste of time and money to enroll in such a program as it will leave you nowhere when it comes to the actual steps you need to take in order to make money online. However, you can still make money online with one of the different methods, but you need a detailed, comprehensive training and guidance from a legit program that is proven to deliver. A 100% LEGIT Alternative To CashGrab By Jamie Lewis? As I explained earlier, the calculator and the tutorials you get with the Cash Grab program are useless and will not provide you with what you need in order to learn how to really make money online. You need to pick one method and learn it from a reliable source with a comprehensive training and guidance. And here comes my alternative to the Cash Grab program. My alternative is the number 1 program that will teach you the best method of making money online, which you can learn about in my Ultimate Make Money Online Guide. The method is 100% legit and newbie-friendly, and one that comes with the lowest possible level of risk, and the program where you will learn this method is 100% legit. And better, you can start a real online business with this method at my recommended program for less than $500, which is less than what you would pay for the Cash Grab with the expensive upsells that I don’t think they will help you make real money anyway. Even better, the recommended program in my guide here will also offer you a Starter Membership in order to try it for FREE before you put any money. This is the same program where I personally learned the best way of making money online, and that’s why I recommend it to you. This program will provide you not only with the detailed, step-by-step training, but it will also provide you with all the necessary tools with the technical support and the amazing community support of 1.4 million like-minded entrepreneurs that are willing to help you whenever you need assistance. All of that for NO Extra Cost or Hidden, Useless Upsells! Go now and read my guide and from there, you will understand what this method is, how it works and why I say it is the best method. And in my guide, you will learn about the recommended program I mentioned above that will help you learn and build your business. 24-7 Wealth Club Review – A Scam Or $13,127 This Week? Daily Profits Review (dailyprofits.cc) – A Scam Or $2,400 Today? !